As I laid down my towel, looked out at the crystal clear blue water and dug my feet into the warm sand, I could not have felt more cool, calm and collected. My vacation at the Royal Blues Hotel had begun — and I was only 10 minutes away from home. 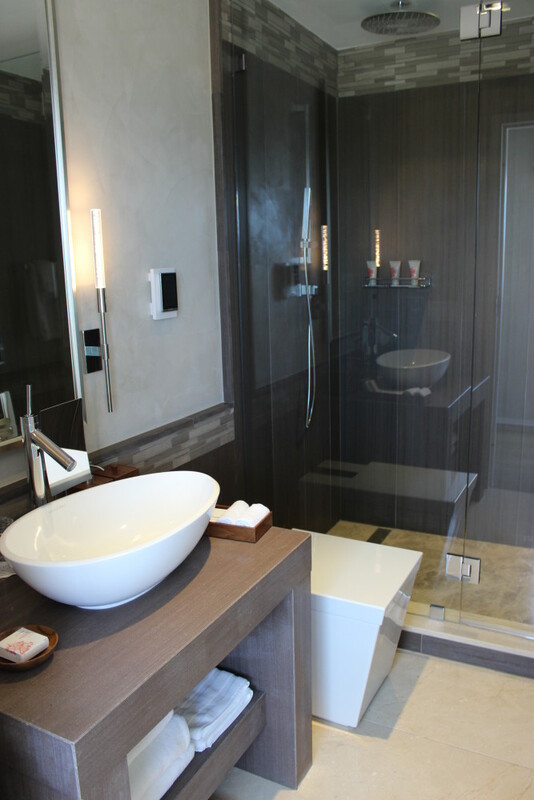 There are only 12 rooms, all facing the beach, with extremely modern features such as remote-operated shades, lighting and shower, and…a sensor-operated toilet. Yes, the toilet lid opens as soon as it senses your presence, flushes on its own, and closes moments later after you’ve left the bathroom. (FYI, there are also buttons located above the toilet, just in case!) I couldn’t get over how cool that toilet was. I even took a video — you can see it on my Instagram feed. My stay at the Royal Blues Hotel was one I will never forget. I felt as though I really was on vacation, far from home. The reality that I live just minutes away from such a beautiful place is still hard for me to believe. 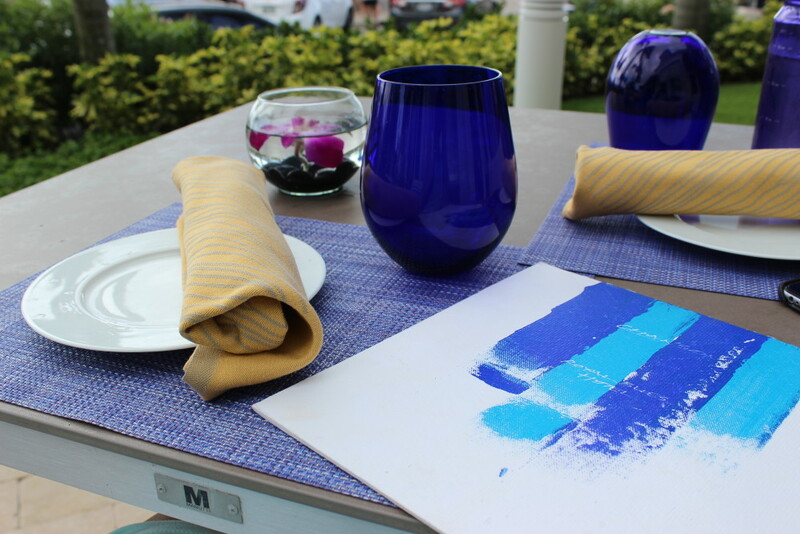 The Royal Blues is more than just an extraordinary hotel with the best of the best in comfort, technology and design — it also prides itself in its fine-dining restaurant, Chanson. While I was absolutely thrilled to have the opportunity to stay at such an upscale resort, I was most excited for dinner! Chanson Restaurant offers a menu focused on high quality ingredients and inventive, unique items that change with the seasons. 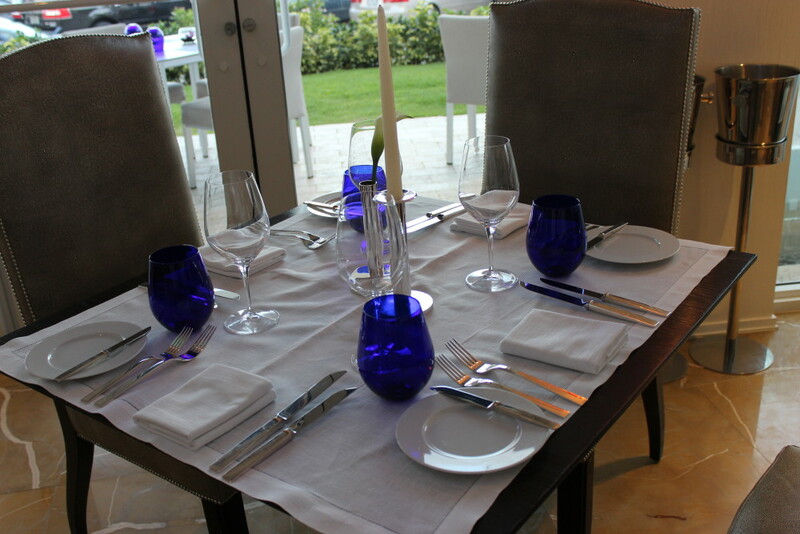 The atmosphere is chic and comfortable with original artwork adorning the walls. 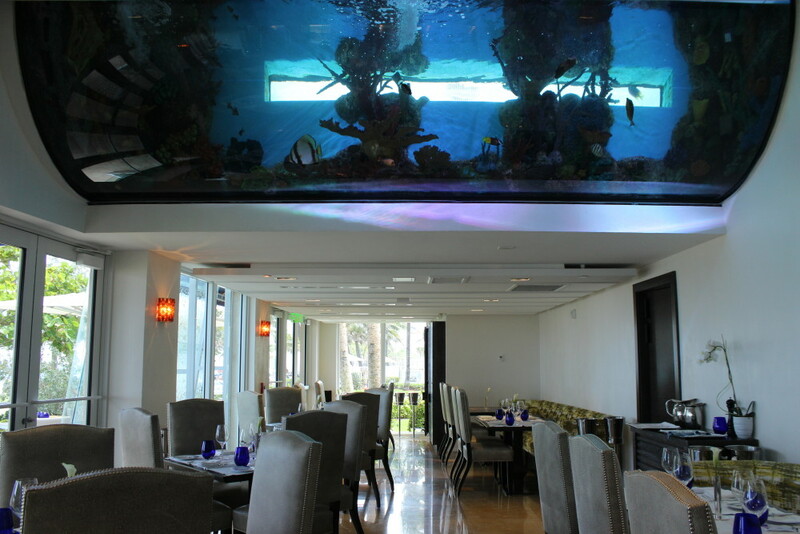 Look up and you’ll see a colorful aquarium; look out and you’ll see the beautiful blue ocean. Chef Sylvain keeps his diners guessing with an ever-changing menu that plays up the best of local and seasonal ingredients. His style of cooking is elegant and modern. He is able to incorporate so many flavors and textures into a dish while still keeping the integrity of the main ingredient, whether it be a succulent piece of fish or a tender slice of Akaushi beef. Most of the menu is comprised of gorgeous fresh seafood, which is perfect for me, but there are vegetarian and meat options as well. Chef Sylvain treated my guest and me to an unbelievable dinner. One by one, each dish he served was better than the last. He veered off the menu a bit, but he and our waiter, Ron, made sure to go over each and every detail with me the next morning. The hospitality I experienced before, during, and after dinner was just exceptional. First, my guest and I were treated to complimentary champagne. As I sipped my JP Chenet Rose, I took a moment to really embrace the night. I am so thankful to be given these kinds of opportunities and love that I can share them with you. We then met the restaurant Sommelier, Abby, who paired our wines for the evening. Based on our preferences, she started us with Frenzy Sauvignon Blanc from New Zealand — a crisp white wine perfect for seafood. When we were ready to switch to a red, Abby brought out a Banshee Pinot Noir from Sonoma County, which drank very smooth and worked well with our food. Ah, the food… Get ready to feast your eyes on some of the most creative descriptions and beautiful plating you’ve ever seen. You are going to want to eat these photos right off your screen! My mouth is watering just thinking about how delicious it all was. 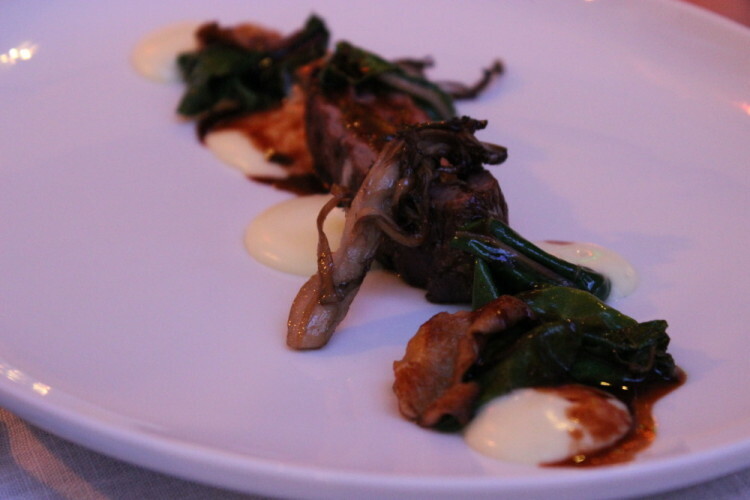 There were two meat dishes that Chef Sylvain prepared for my guest, and even those looked good enough for me to eat! Let’s get to it, shall we? We started with freshly baked focaccia bread and a Tonato spread — an Ahi tuna pate with malted garlic and harissa spice. That spread was amazing. I’ve never had something like this before, and truthfully did not even need the bread. I could eat that all on its own! 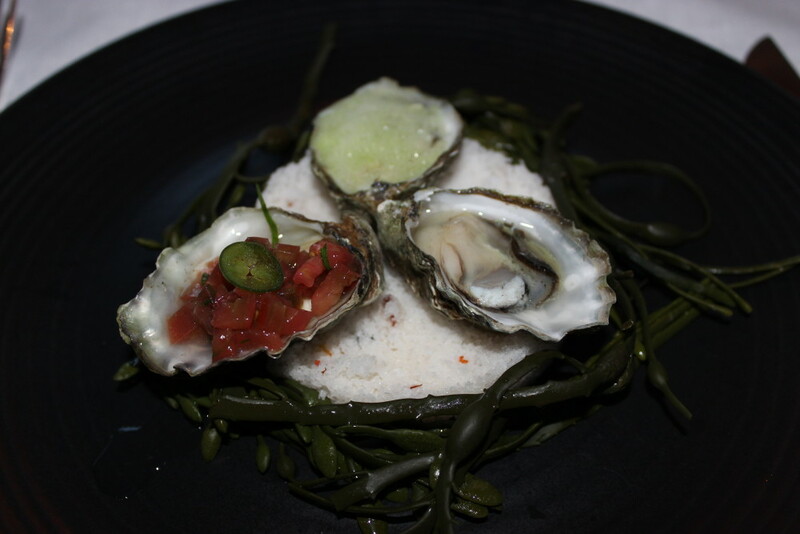 Kumomoto oysters — one with pickled cippolini onion and a parsley emulsion, one with tomato salsa, and one plain. Coincidentally, Kumomota oysters are my favorite! 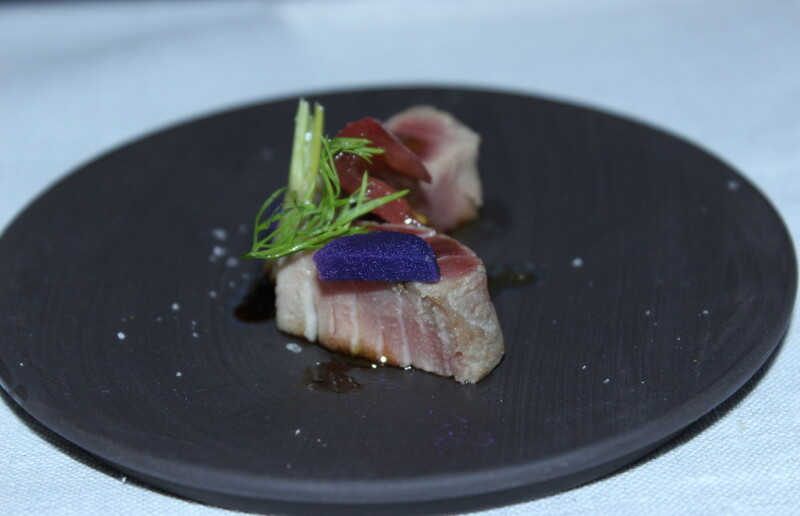 Ahi Tuna Nicoise with Belgian endive micro fennel greens drizzled with lemon infused olive oil, Maldon sea salt and blue potato. To the eye, it looks so simple. 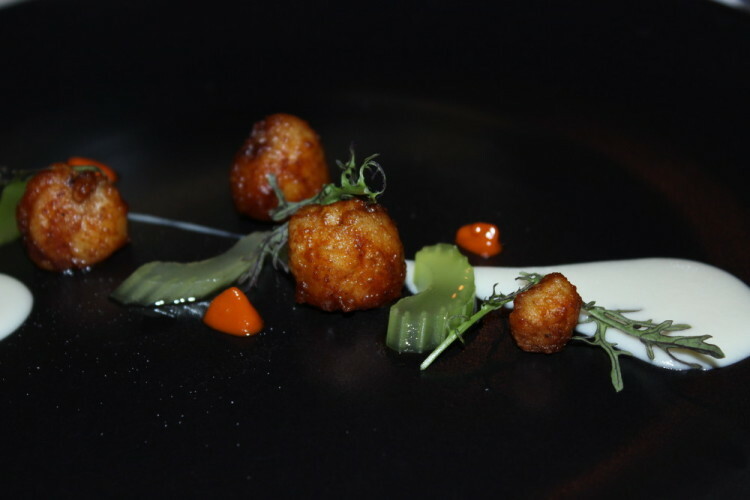 But once you taste, you realize the complexity of the flavors and textures, and it is just mind-blowing. Lightly poached lobster topped with crunchy quinoa, cauliflower crisps, salmon roe and serrano chili drizzled with yuzo vinaigrette. My eyes bulged out of my head when I saw this dish being walked to our table. The colors! I almost didn’t want to eat it because it was just so pretty. But, um, thankfully I dug right in because it was too delicious to let go untouched! 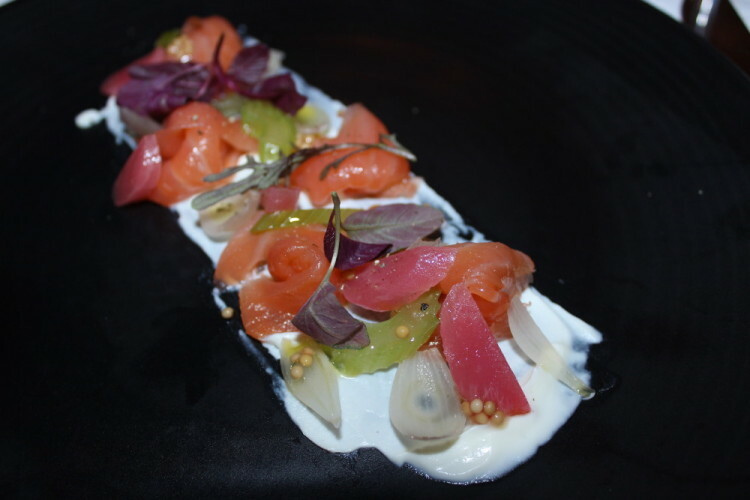 Wild King Salmon confit, lightly cured in salt, with candy cane heirloom beets on a smear of crème fraîche, pickled mustard seeds and compressed celery. Another beauty! The way Chef Sylvain plays with color really makes each dish so memorable. How could you ever forget something this gorgeous?! Buffalo Frog Legs with a celeriac and blue cheese sauce and compressed celery. We all weren’t sure how to categorize this next dish — is it land or sea? Since frog legs are most frequently described as being very much like chicken, I chose to forgo this one and let my guest have a little something all for herself. Chef Sylvain makes his own buffalo sauce which added a little extra zing. If you’re up for trying something a little different, this is it! 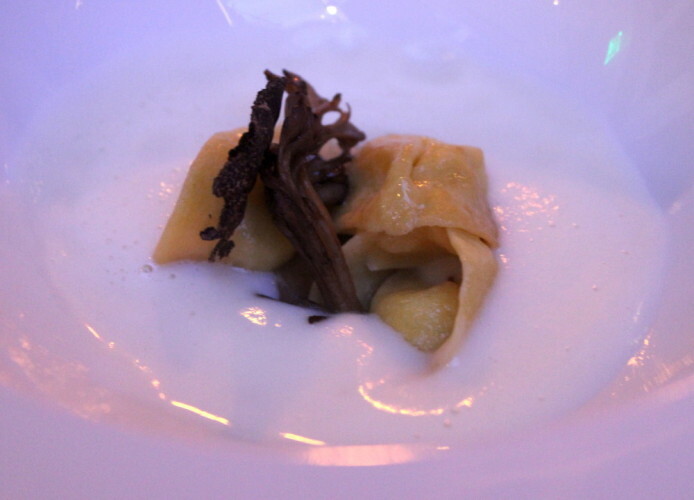 Ricotta and black truffle stuffed tortellini with maitake mushrooms marinated in lemon infused olive oil and sherry vinaigrette with sliced Jerusalem artichokes. 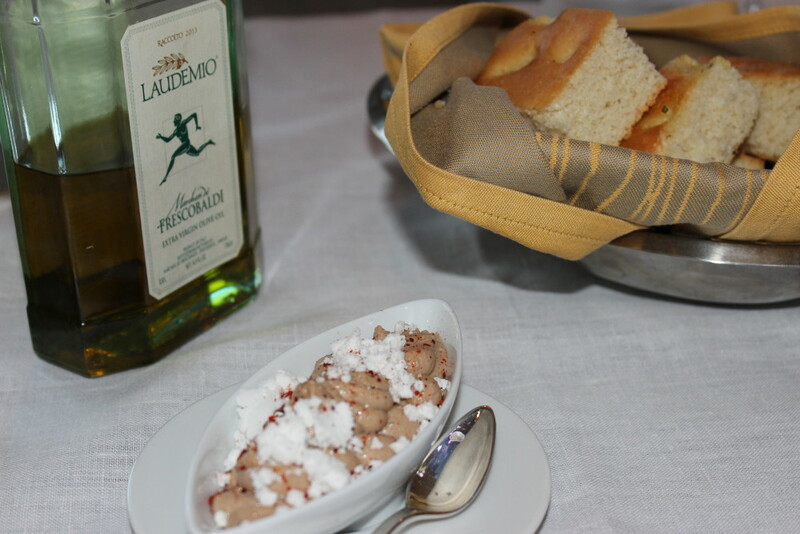 A velouté sauce made of Jerusalem artichokes, milk and truffle oil was poured tableside. TRUFFLE is used twice here. Need I say more?! This dish was another one for my guest — Akaushi beef rib eye, seared and served with potato mousseline, sautéed kale and maitake mushrooms, finished with bordelaise sauce (a red wine sauce). It was a gorgeous plate of food, and the smell alone was intoxicating! I saved the best for last. 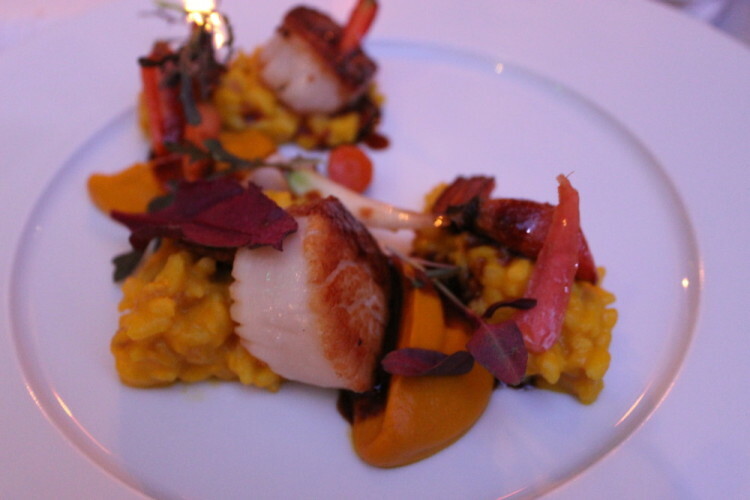 Seared Diver Scallops with yellow curry farro risotto, carrot puree and sautéed baby root vegetables. It’s so hard to choose a favorite since everything was just so good, but I loved this dish. Using farro for the risotto gives it more of a bite, and the curry flavor complemented the root vegetables very well. The dish was rounded out with perfectly seared scallops that just about melted in my mouth. Ah, I need to eat this again! Well, okay, that was not last. Dessert is last, as always. This is “Lemon Meets Pistachio,” a pistachio cookie topped with pistachio gelato and lemon custard, crushed pistachios, powdered sugar and candied lemon zest, finished with lemon jelly. For someone who only recently started loving lemon desserts, this was just the thing to absolutely make me a lemon-lover. I have been waiting for this S’mores dessert since the moment I learned about the Royal Blues Hotel. 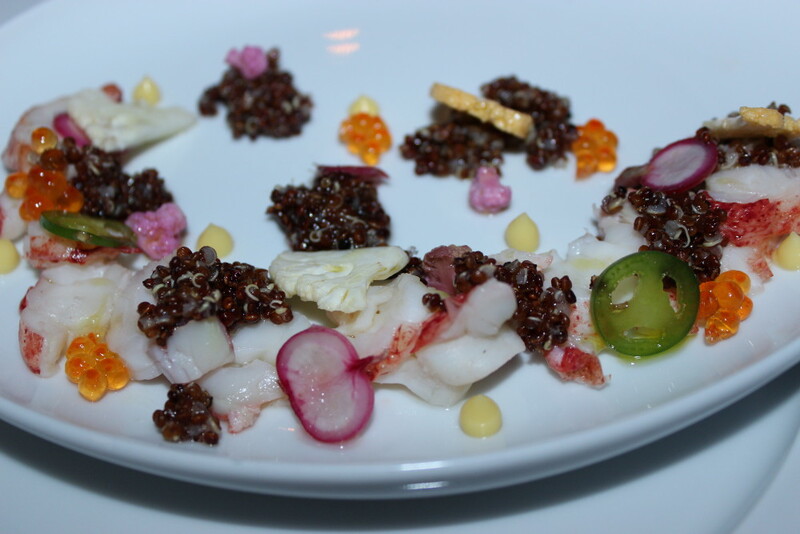 Months ago, I met another travel blogger who visited the hotel and dined at Chanson. 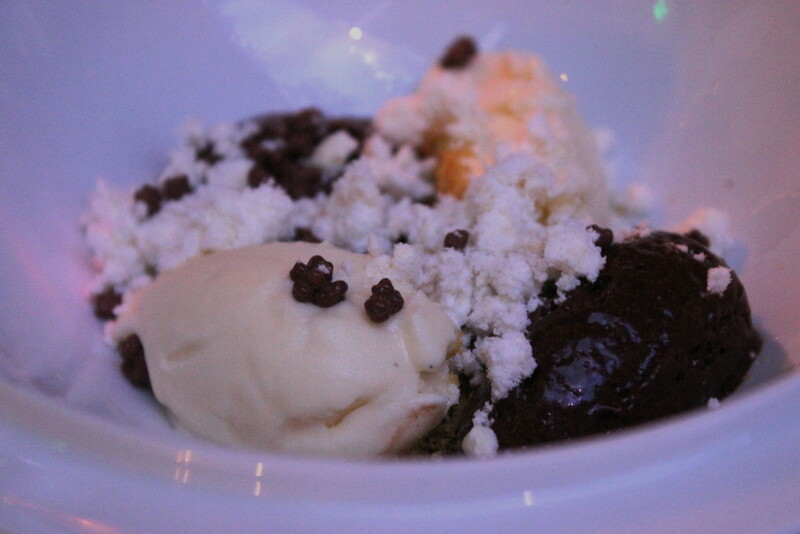 She raved about this dessert, and I’ve been dreaming about it ever since. It sure lived up to my expectations! 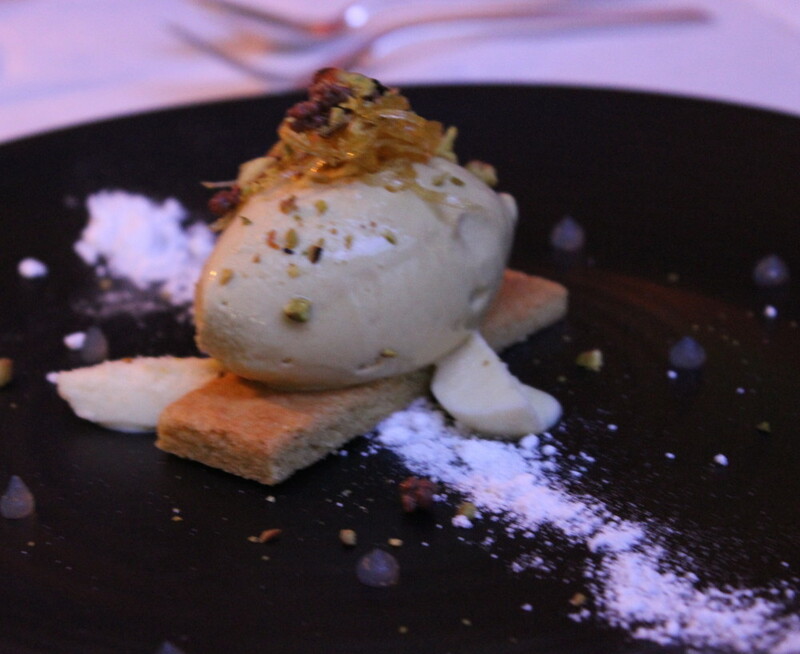 Almond cookie served with chocolate sorbet and vanilla gelato, topped with malted white chocolate and chocolate pop rocks (so cool!). It was served under a glass filled with hickory smoke to really give it that authentic campfire s’mores aroma. 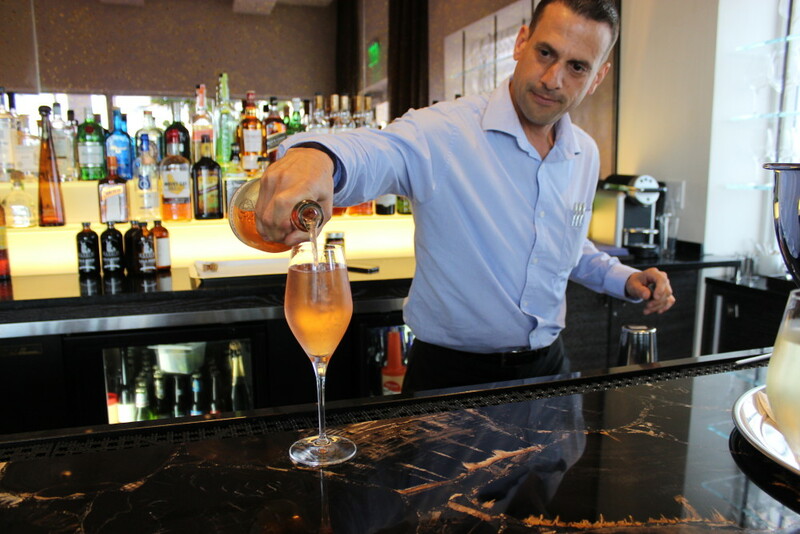 Take note that Chanson is only open for dinner Tuesday to Sunday from 5:30 – 10 pm. 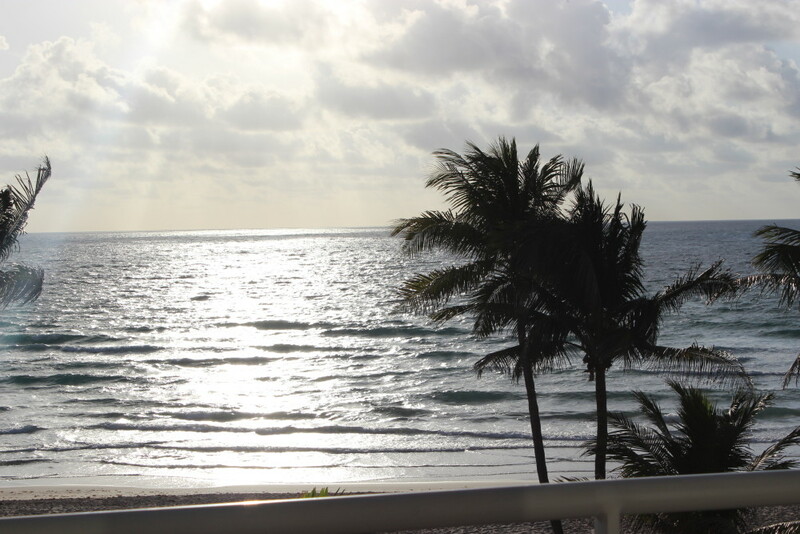 The hotel offers breakfast, lunch and dinner in the lounge, with oceanfront seating right outside the hotel doors where you can sit and take in the fresh air. This is where I spent most of my morning and afternoon before sadly leaving the Royal Blues. I enjoyed a beautiful spread of fresh fruit, Greek yogurt, granola and honeycomb with my brunch cocktail of choice, a Bellini. 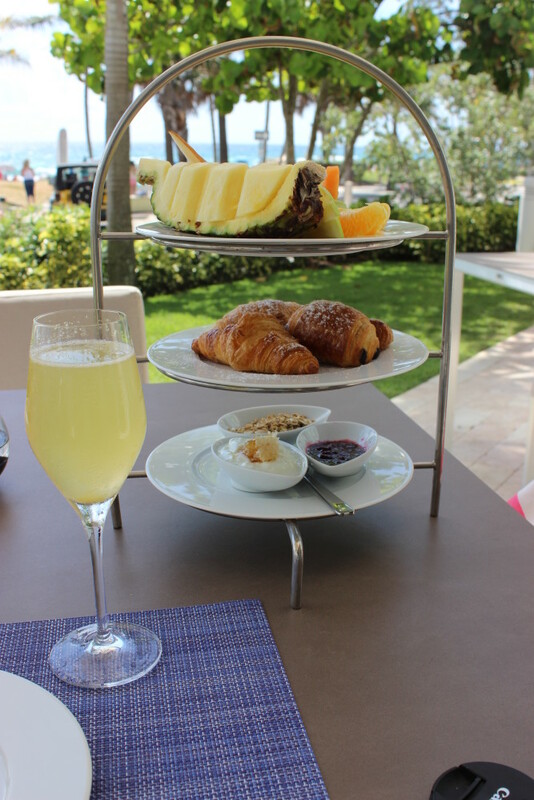 There is no better place to have breakfast than sitting outside in the sun, watching the waves roll in. I never wanted to leave! 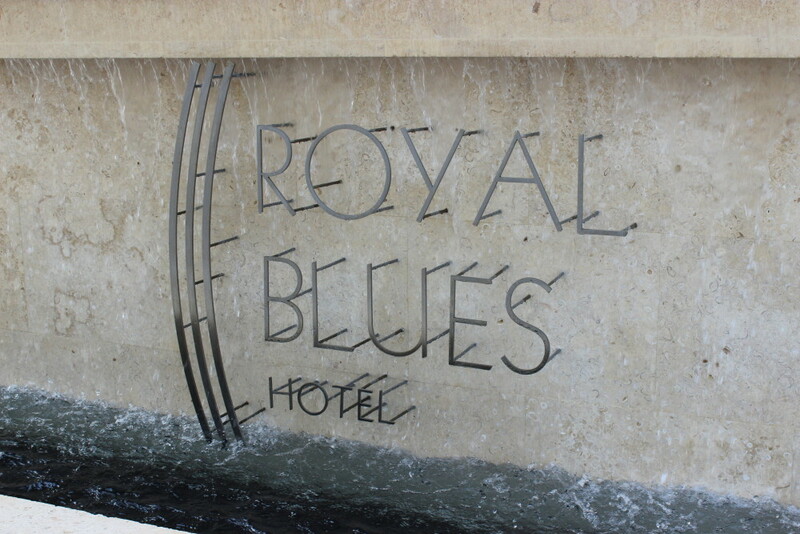 From the moment I walked through the doors at the Royal Blues Hotel, I was treated with such wonderful service. There was Whitney, who greeted me and escorted me to my room; Ron, our wonderful server during dinner; Erica, my server at breakfast who was so bubbly and friendly you can’t help but smile at her energy; Claude, the General Manager, whom I only met briefly and hope to see again during my next visit; Guilherme, the extremely hospitable Beverage and Lounge Manager; and last but certainly not least, Chef Sylvain, who I am just itching to see again soon so I can savor more of his delicious cooking! 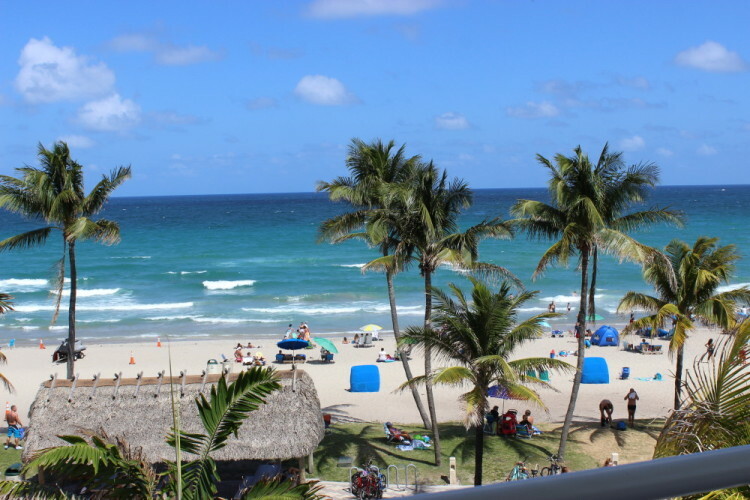 The Royal Blues Hotel is paradise located right in Deerfield Beach, FL. 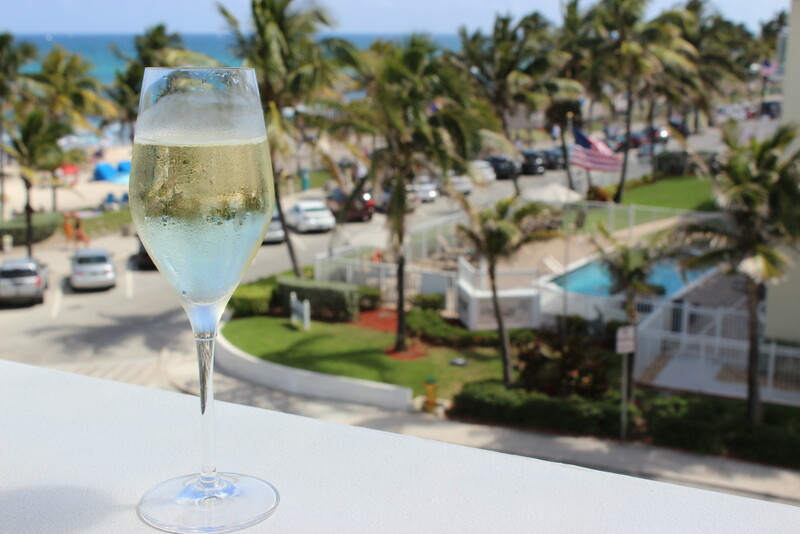 It’s the perfect place for a special getaway — whether you are celebrating an anniversary, a bridal shower, or just want to have a girls’ weekend or extra special date-night, this is one exquisite place for your celebration. 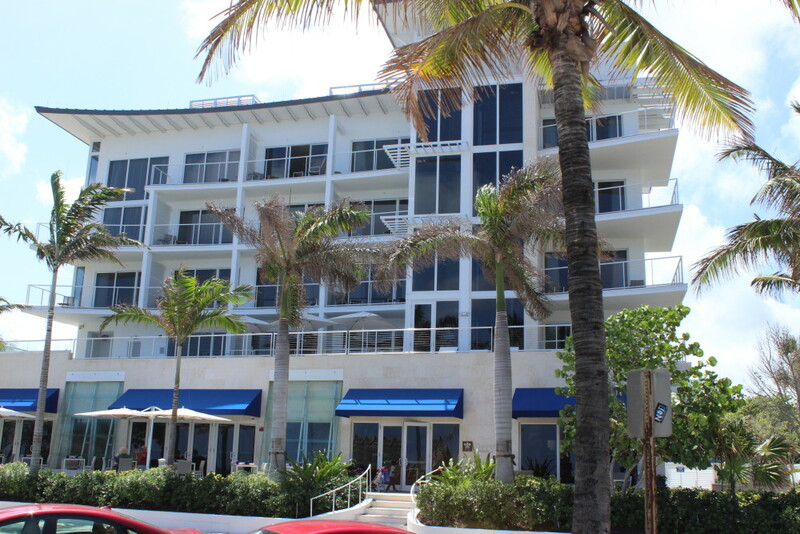 The Royal Blues Hotel is located at 45 NE 21st Avenue in Deerfield Beach. Disclosure: I was provided with complementary accommodations at the Royal Blues Hotel as well as dinner at Chanson Restaurant and breakfast in the lounge. There is no monetary compensation provided for this review. As always, all opinions are 100% my own. Hahaha, Terri, the toilet was the best part!